Gluten-free bread products are often considered inferior in texture and taste compared to regular bread, but that is set to change with Riviera Bakery partnering with the University of Adelaide to develop a range of gluten free breads with functional properties for health and wellbeing. The project aims to deliver a new range of gluten free, functional breads with quality and consumer acceptance comparable to that of regular bread. The research involved Dr Katie Wood, a certified Dietician, reviewing potential functional ingredients for which there are proven health benefits and including them in recipes in quantities where content claims, such as ‘source of protein’, ‘excellent source of fibre’, ‘good source of omega-3’, can be made. Trial batches of bread rolls were made in the baking laboratory at the Waite campus by scientists from the University of Adelaide. These were based on Riviera’s existing plain gluten-free bread recipe with the addition of some of the functional ingredients. The best bread recipes were selected and made at the Riviera Bakery. 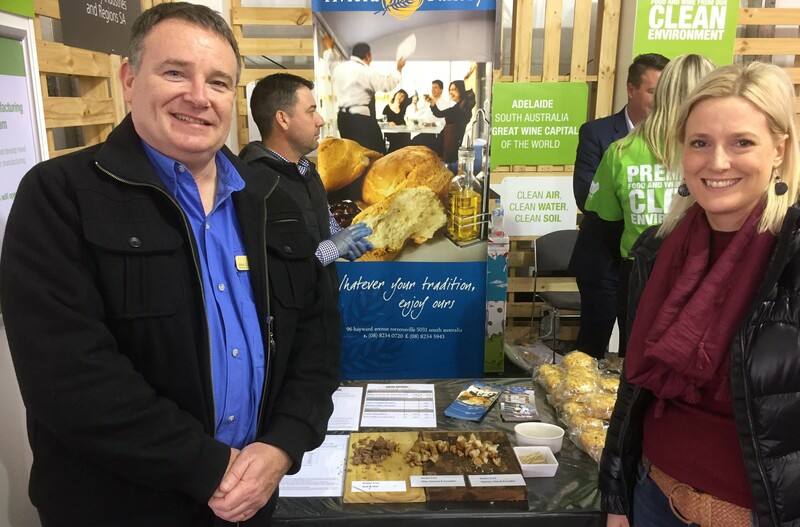 To identify those with the best texture and taste characteristics, these products underwent sensory testing within the company, with selected customers and then with members of the public, including at the 2017 Royal Adelaide Show. Five functional recipes were trialled, and two of them will be put into commercial production from March 2018 for sale in supermarkets throughout SA. “This has been an excellent collaboration between researchers and industry. The ability to use the AFM grant to help put new products on supermarket shelves so quickly is very pleasing,” said lead researcher Dr John Carragher. ”Developing a ’healthy’ gluten free bread that had a pleasant after taste had proved quite difficult to achieve and the grant program gave us the opportunity to tap into the expertise at the University that would not ordinarily be available to business of our size,” Stuart Phillips, Managing Director of Riviera Bakery said. This project was awarded $27,000 in Round 3 of the Primary Industries and Regions South Australia Advanced Food Manufacturing Grant Program (2017). This entry was posted in Agriculture & Food, Collaboration, Health, Impact stories, Science, Uncategorized and tagged bread, Dr John Carragher, gluten free. Bookmark the permalink.